Objective To determine the effects of a multifaceted paediatric rapid response system on the duration of predefined clinical instability and the subsequent rate of cardiac arrests. Methods An interrupted time series study coupled with a retrospective chart review to evaluate the effects of implementing a four component paediatric rapid response system. All patients in a 136-bed university-affiliated paediatric hospital from August 2003 to May 2007 were considered. The main outcome measures included rate of cardiac arrests as indicated by the number of patient days between ward paediatric cardiac arrests and duration of predefined clinical instability before evaluation by critical care personnel. 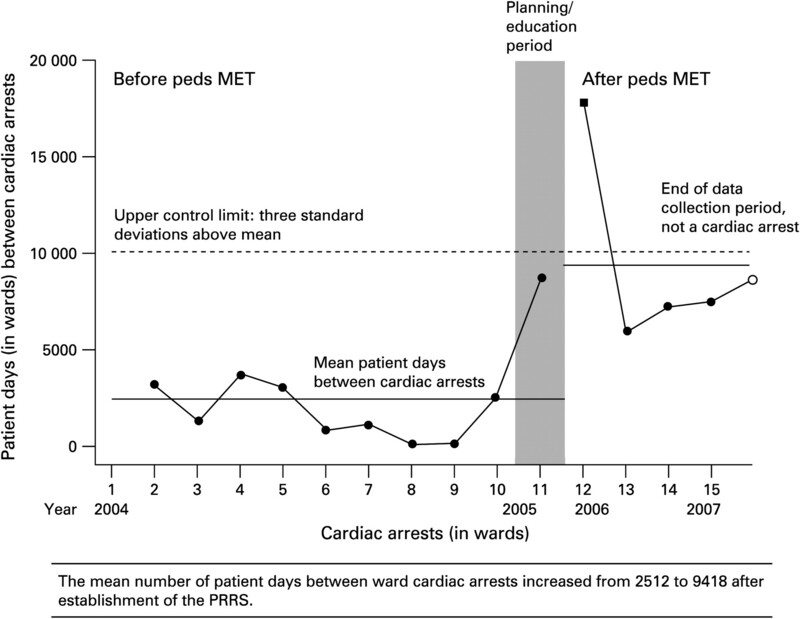 Results The mean time interval between cardiac arrests increased significantly with the establishment of the rapid response system from a baseline of 2512 to 9418 patient days. The median duration of clinical instability decreased from 9 h 55 min to 4 h 15 min post intervention (p=0.028). Conclusions The implementation of a paediatric rapid response system is associated with a significant reduction in the rate of cardiac arrests and duration of clinical instability before evaluation by critical care personnel. This study provides evidence that implementation of a rapid response system brings emergency personnel to deteriorating patients earlier, thus preventing cardiac arrests. It has been theorised that the implementation of an RRS improves efficiency in recognising and responding to clinically deteriorating patients.15 23 We hypothesised that implementation of a four component paediatric rapid response system (PRRS) would decrease the rate of cardiac arrests and the duration of clinical instability before critical care personnel evaluation. This study was conducted at a 136-bed university-affiliated paediatric hospital with approximately 5900 annual admissions. All patients in the hospital from August 2003 to May 2007 were considered with full implementation of a PRRS completed on 1 August 2005. All paediatric medical and surgical services are provided including emergency, outpatient, trauma, cardiac surgery, organ transplantation and extra corporeal life support. This study was approved by the Institutional Review Board. Requirement for informed consent was waived. Prior to development of the PRRS, the emergency response system was structured according to the “traditional” cardiac arrest team concept in which the team was summoned for a cardiac or respiratory arrest. Critical care assessment for less emergent cases involved the typical chain of events leading to unplanned admission to the paediatric intensive care unit (PICU) as shown in figure 1 (before PRRS). Process flow map from clinical instability to PICU assessment—before and after PRRS. The median time from clinical instability to PICU assessment decreased by 5 h 40 min in unplanned PICU admissions after the establishment of the PRRS (p=0.028). All PRRS and code blue calls were regarded as possible cardiac arrests. The same team responded to all paediatric medical emergencies in areas excluding the neonatal and paediatric ICU and operating suites. Upon arrival the MET provided medical evaluation and treatment as required. A PRRS data collection form was completed by the MET and then collected by the investigators. 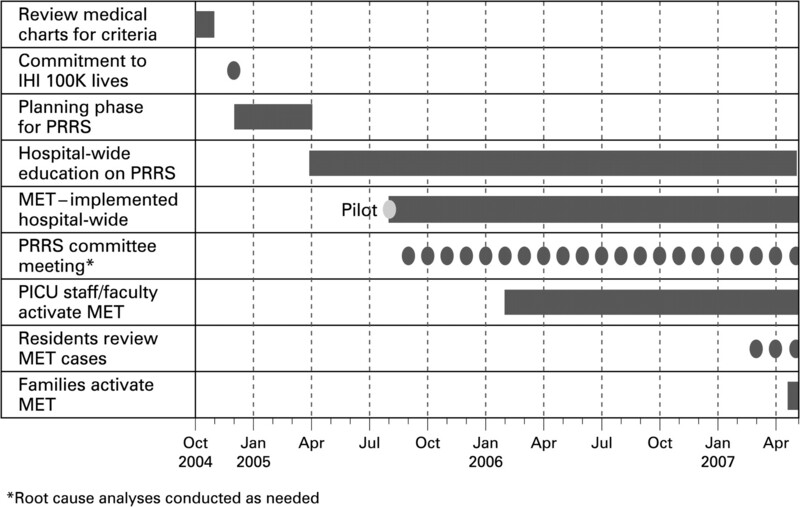 The timeline illustrating implementation of the four component PRRS is shown in figure 2. PRRS implementation timeline. *Root cause analyses conducted as needed. Two independent physicians conducted a retrospective review of the patient charts for which the PRRS was activated during the 12 months after implementation. There were a total of 68 PRRS activations but only 59 charts available for review. In addition, 42 of 126 unplanned PICU admissions that occurred during the 12-month period before PRRS and 41 of 128 unplanned PICU admissions from the 12-month period after PRRS were randomly selected for review. The unplanned PICU admissions reviewed did not include cardiac arrests, respiratory arrests or PRRS activations. All charts were reviewed to evaluate the type of event and presence and duration of documented clinical instability during the 24 h before the event. The reviewers were not blinded from the patient outcomes and PRRS intervention but were not aware of the other physician reviewer's analysis. Events were classified as unplanned PICU admissions, PRRS activations, cardiac arrests or respiratory arrests. An unplanned PICU admission was defined as any patient who was transferred from the wards to the PICU. A PRRS activation was defined as any patient for whom the MET responded. Using Utstein reporting guidelines, cardiac arrest was classified as the cessation of detectable cardiac mechanical activity, determined by the absence of a palpable pulse, responsiveness and apnoea.24 25 To determine duration of clinical instability, documented antecedents were recorded if they met the predefined criteria described in table 1. Only antecedents documented with both a time and date were recorded. If only one reviewer found an antecedent in the medical record that antecedent was excluded. If both reviewers recorded an antecedent but at different time intervals, the time nearest that of critical care personnel assessment (ie, shortest duration of instability) was used in the analysis. Patient days (in wards) between cardiac arrests (n=15 cardiac arrests). The mean number of patient days between ward cardiac arrests increased from 2512 to 9418 after establishment of the PRRS. Mortality and cardiac arrest rates were calculated per 1000 admissions. Statistical analysis consisted of the one-tailed Fisher's exact test. Statistical p values and risk ratios (RR) with associated 95% confidence intervals (CI) are reported with significance defined as p<0.05. To document the inter-rater reliability, the number of disagreements was divided by the number of dual-reviewed charts times the nine potential antecedents per chart. One minus this number yielded an inter-rater reliability index. A one-tailed Mann-Whitney test was used to evaluate non-normally distributed data, such as median time interval from first documented antecedent to ICU assessment. The mean number of patient days between ward cardiac arrests increased significantly from 2512 to 9418 after establishment of the PRRS (figure 3). The data point outside the upper control limit indicates a significant change to the system. The ward cardiac arrest rate/1000 ward admissions was 1.27 before PRRS implementation and 0.45 after PRRS implementation with an RR of 0.35 (95% CI: 0–1.24; p=0.126) (table 2). The ward death rate/1000 ward admissions was 1.5 before PRRS implementation and 0.45 after PRRS implementation with an RR of 0.30 (95% CI: 0–1.04; p=0.070). This death rate included patients with do not resuscitate orders since there was not a reliable means for querying the mortality data for do not resuscitate orders. A total of 151 charts were examined by both reviewers. Of 1359 opportunities for disagreement, only 184 disagreements occurred yielding an inter-rater reliability of 86.5%. Antecedents were found by both reviewers in 38 of 59 PRRS activations, 33 of 42 unplanned PICU admissions (before implementation of the PRRS) and 31 of 41 unplanned PICU admissions (after implementation of the PRRS). There was no significant difference in the number of unplanned PICU admissions, hospital admissions or paediatric cardiac surgery cases in the study periods. 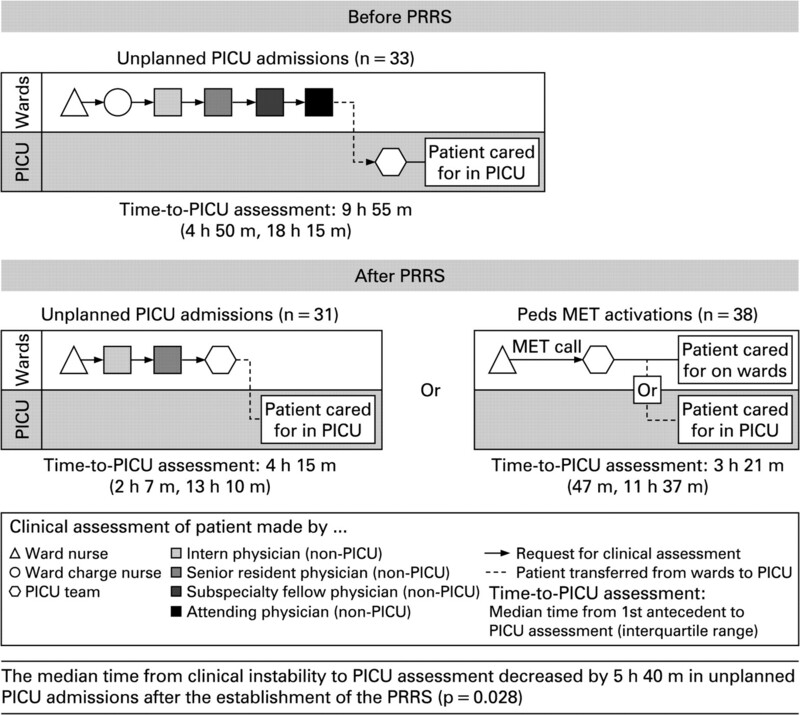 In the evaluation of unplanned PICU admissions the median time interval was determined by the amount of time from first documented antecedent to ICU assessment (figure 1). This time interval decreased from 9 h 55 min before PRRS implementation to 4 h 15 min after PRRS implementation (p=0.028). Likewise, for PRRS activations the median time interval from first documented antecedent until ICU assessment was 3 h 21 min. The measures used to evaluate the PRRS such as activation personnel, activation criteria and outcomes are summarised in table 3. The median duration of MET assessment, or time away from the ICU, was 19 min. The median number of PRRS activations was 14/1000 ward admissions. In this study, we showed a decrease in cardiac arrest rate as indicated by a significant increase in patient days between cardiac arrests. For events that yield high death rates, like cardiac arrests, Shewhart control charts improve the likelihood of identifying rate changes in a clinically significant period. Traditional statistical tests such as the Fisher's exact test require unfeasible periods to detect a significant change for rare event data such as paediatric cardiac arrests. The use of this approach to evaluate rare event data is recommended by many industry and healthcare organisations.28 29 30 This method of analysis is the most appropriate model for our study examining paediatric cardiac arrest rates. During the study period, we did not detect an increase in cardiac arrest rates in the intensive care unit. In fact, there was a decrease in cardiac arrest rates of the combined PICU and ward cardiac arrests per 1000 admissions from 4.07 to 2.04 after the PRRS intervention. This contradicts the theory that patients were transferred to the ICU and merely experienced cardiac arrest in a different location. As with every research endeavour, there were limitations to our study. First, we were reliant upon humans to trigger the system. While non-human based monitoring systems able to recognise an escalating risk of cardiac arrest and activate an RRS do exist, they have not been well studied and are not available for a paediatric population. Second, this study was an interrupted time series in one hospital. There is the possibility of some other factor contributing to the increase in days between cardiac arrests and reduction in duration of clinical instability. However, we are unaware of any factors that could have influenced our results in this period. Finally, it is possible that the benefits described in our paper occurred by merely focusing hospital-wide efforts on improving recognition and resuscitation skills. Although we believe that the sustained improvement we found could not be attributed to education alone, it is not clear which components of the PRRS are the most important in preventing cardiac arrests. In conclusion, the introduction of a PRRS was associated with both an increase in the number of patient days between ward cardiac arrests and a decrease in the duration of clinical instability before critical care personnel assessment. It is likely that earlier assessment of deteriorating patients by critical care personnel can prevent cardiac arrests and lead to the increased number of patient days between ward cardiac arrests. A recent commentary's authors cautioned that efforts to improve patient safety, such as RRS, should be supported by sufficiently strong evidence to warrant such a commitment of resources.31 This effective system was implemented without the need for additional staff or unfeasible work load additions to the MET members. We believe the traditional structure of a “code blue team” is unsatisfactory and the need for a carefully designed system change to prevent cardiac arrests such as an RRS is a feasible way to prevent in-hospital cardiac arrests. We thank Lloyd Lloyd Provost, MS, of Associates in Process Improvement, Austin, Texas, USA, for his advice and assistance in creating rare event control charts and statistical analysis.
. A comparison of high-dose and standard-dose epinephrine in children with cardiac arrest. N Engl J Med 2004;350:1722–30.
. Treatment of comatose survivors of out-of-hospital cardiac arrest with induced hypothermia. N Engl J Med 2002;346:557–63. Hypothermia after Cardiac Arrest Study Group. Mild therapeutic hypothermia to improve the neurologic outcome after cardiac arrest. N Engl J Med 2002;346:549–56.
. Survival outcomes after extracorporeal cardiopulmonary resuscitation instituted during active chest compressions following refractory in-hospital pediatric cardiac arrest. Pediatr Crit Care Med 2004;5:440–6.
. Cardiopulmonary resuscitation of adults in the hospital: a report of 14 720 cardiac arrests from the National Registry of Cardiopulmonary Resuscitation. Resuscitation 2003;58:297–308.
. First documented rhythm and clinical outcome from in-hospital cardiac arrest among children and adults. JAMA 2006;295:50–7.
. Recognizing clinical instability in hospital patients before cardiac arrest or unplanned admission to intensive care. A pilot study in a tertiary-care hospital. Med J Aust 1999;171:22–5.
. Association between clinically abnormal observations and subsequent in-hospital mortality: a prospective study. Resuscitation 2004;62:137–41.
. Avoidable cardiac arrest: lessons for an A&E department. Accid Emerg Nurs 2003;11:196–201.
. Developing strategies to prevent in hospital cardiac arrest: analyzing responses of physicians and nurses in the hours before the event. Crit Care Med 1994;22:244–7.
. Antecedents to hospital deaths. Intern Med J 2001;31:343–8.
. Duration of life-threatening antecedents prior to intensive care admission. Intensive Care Med 2002;28:1629–34.
. A comparison of antecedents to cardiac arrests, deaths and emergency intensive care admissions in Australia and New Zealand, and the United Kingdom—the ACADEMIA study. Resuscitation 2004;62:275–82.
. Prospective controlled trial of effect of medical emergency team on postoperative morbidity and mortality rates. Crit Care Med 2004;32:916–21.
. Effects of a medical emergency team on reduction of incidence of and mortality from unexpected cardiac arrests in hospital: preliminary study. BMJ 2002;324:387–90.
. Use of medical emergency team responses to reduce hospital cardiopulmonary arrests. Qual Saf Health Care 2004;13:251–4.
. Reduction of paediatric in-patient cardiac arrest and death with a medical emergency team: preliminary results. Arch Dis Child 2005;90:1148–52.
. Implementation of a medical emergency team in a large pediatric teaching hospital prevents respiratory and cardiopulmonary arrests outside the intensive care unit. Pediatr Crit Care Med 2007;8:236, 46; quiz 247.
. Effect of a rapid response team on hospital-wide mortality and code rates outside the ICU in a children's hospital. JAMA 2007;298:2267–74.
. Introduction of the medical emergency team (MET) system: a cluster-randomized controlled trial. Lancet 2005;365:2091–7. The Joint Commission 2008 National Patient Safety Goals Hospital Program. http://www.jointcommission.org/PatientSafety/NationalPatientSafetyGoals/08_hap_npsgs.htm (accessed 12 Sep 2007). The Institute for Healthcare Improvement Protecting 5 Million Lives From Harm Campaign. http://www.ihi.org/IHI/Programs/Campaign/ (accessed 12 Sep 2007).
. Findings of the first consensus conference on medical emergency teams. Crit Care Med 2006;34:2463–78.
. Utstein style reporting of in-hospital paediatric cardiopulmonary resuscitation. Resuscitation 2000;45:17–25.
. Recommended guidelines for uniform reporting of pediatric advanced life support: the Pediatric Utstein Style. A statement for healthcare professionals from a task force of the American Academy of Pediatrics, the American Heart Association, and the European Resuscitation Council. Resuscitation 1995;30:95–115.
. Number-between g-type statistical quality control charts for monitoring adverse events. Health Care Manag Sci 2001;4:305–18.
. Control chart techniques for time oriented rare event data. Fourth Annual American Society for Quality Symposium. Automotive Division, Detroit and Ann Arbor Sections. Rochester, MI: Oakland University, 2006. JCAHO Comprehensive Accreditation Manual for Hospitals: The Official Handbook. Oakbrook Terrace, IL: Department of Publications; Joint Commission Resources, 2007.
. Rapid response teams—walk, don't run. JAMA 2006;296:1645–7. This is a reprint of an article that appeared in Quality & Safety in Health Care, December 2009, volume 18, page 500. Reproduced with kind permission from author and publisher.